Haiti Cultural Exchange is pleased to announce a new collaboration with Brooklyn Public Library for community members over 50 years of age, Creative Aging. Teaching artist, Riva Precil, will lead participants on a visual exploration of Haitian arts and culture through painting, collage, mask-making and beading. The program will run for 10-weeks at the Canarsie Library. To register, please call: 718.257.6547. Born in Brooklyn, Riva grew up in Haiti where she studied music, folkloric and modern dance, art, and theatre under some of the most important teachers of their genre. She obtained a degree in Music Therapy at Loyola University in New Orleans and completed a Music Therapy internship at Beth Israel Medical Center in Manhattan. She has had the opportunity to teach music, art, and movement to a wide variety of populations in diverse settings, such as day care centers, children’s hospitals, nursing homes, and schools. 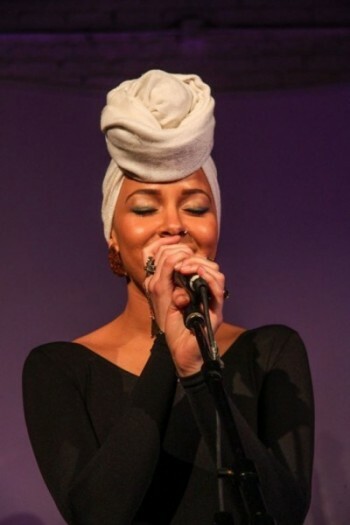 As a musician, Riva has performed at numerous venues including the New Orleans Jazz Festival, The Jazz Gallery, Atlantic Antic and Make Music New York festivals. This entry was posted on Wednesday, February 10th, 2016 at 3:36 pm	and is filed under Arts, Classes, Dance, HCX Collaborations, Literature, Music, Theater, Uncategorized. You can follow any responses to this entry through the RSS 2.0 feed. You can leave a response, or trackback from your own site.